The department’s training and competitive facilities are its classrooms, wherein talented student-athletes hone their skills and strive to reach their potential. Coaches prepare student-athletes for competition and success as students, athletes and citizens. Coaches teach life lessons that nurture future leaders, emphasizing personal responsibility. Teams focus on winning, but winning transcends the final score of any game or grade-point average. Winning is about succeeding in life. Competitive and practice facilities are inextricably linked to athletic success. For recruits and their parents, high caliber facilities speak to an institutional commitment to excellence. To continue to attract the best and brightest talent – to compete and to coach – Ohio State must continue to provide state-of-the-art facilities. A new master plan for a discrete Athletic District has been created to build upon the stellar tradition of competitive success for which Ohio State has become widely recognized. 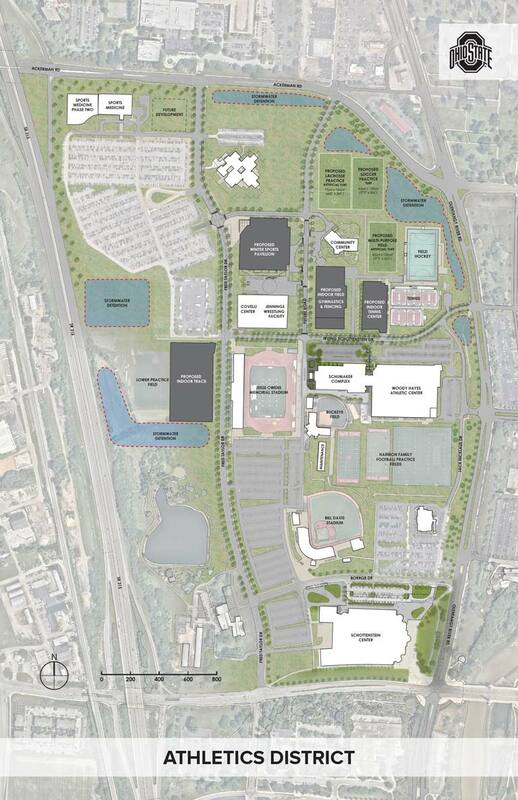 The Athletics District will consolidate the vast majority of practice and competitive facilities into a contiguous space. Doing so will capitalize on all the economies of scale such a district affords, providing student-athletes and their coaches the optimal training and competitive environments. In addition, the relocation of worn, existing facilities into the newly created Athletic District will allow the university to maximize the use of vacated space in a highly desirable location for its core academic mission. for student-athletes, coaches, and Ohio State. Gene Smith, Vice President and Director of Athletics. In order to maintain the level of excellence that has become synonymous with Ohio State Athletics, the department must strive to exceed national standards in all facets; from academic achievement to the development and renovation of state-of-the-art facilities. This is only possible with the generosity of some of Ohio State’s most dedicated and loyal supporters. Through the contributions of these benefactors, Ohio State Athletics is able to construct some of nation’s most impressive practice and competitive facilities. For more information about our Capital Projects, please feel free to call (614) 292-9908 or email BuckeyeClub@osu.edu with any questions.